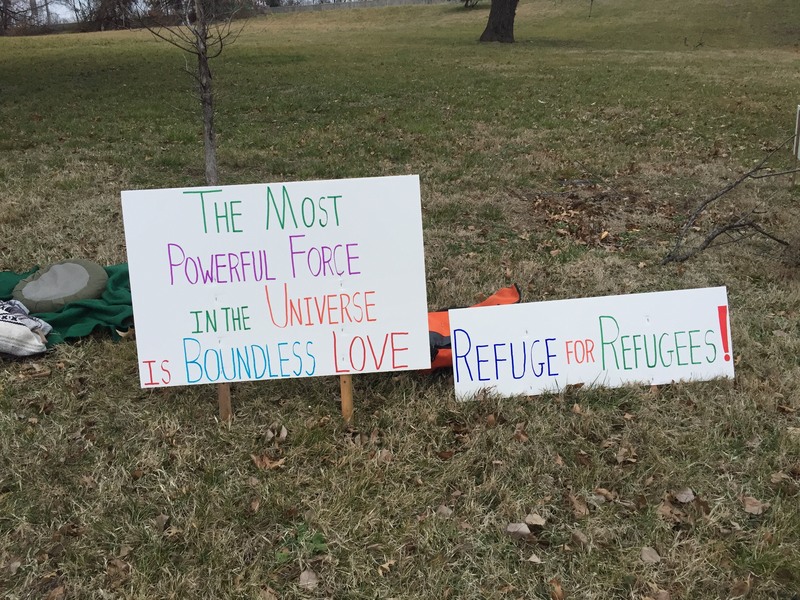 This past Friday (2/3/17), from 4 to 6 pm on the grassy knoll at the intersection of North and Mount Royal, we practiced sitting meditation with posters expressing our support for refugees and Muslims and our opposition to Trump’s travel ban. I have no clue how drivers experienced our witness. 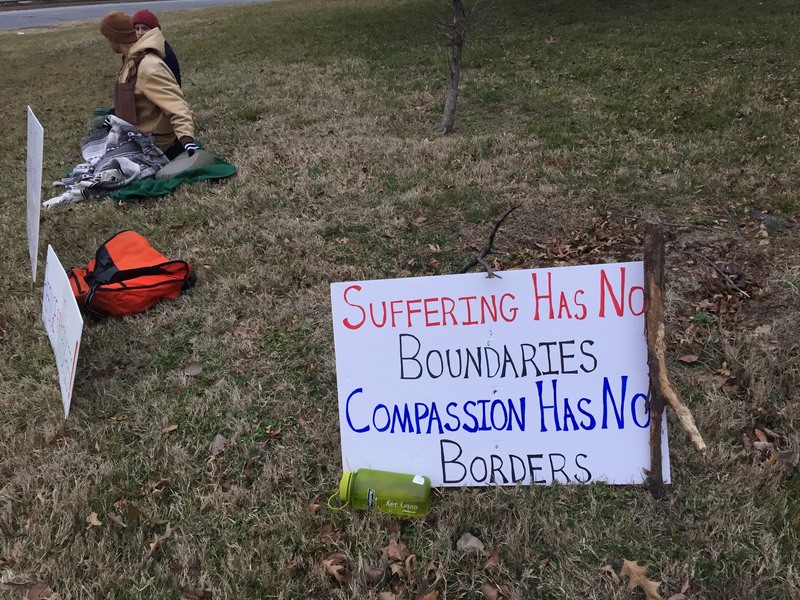 But we did speak with someone who approached us after spotting our signs. He mentioned that he’s currently unemployed and lives in a tent with his dog, somewhere in the city. He talked about his struggles and framed them with the same kind of anti-immigrant anger and fear that’s been a core part of Trump’s agenda and worldview. The man had a lot to say and, to be honest, I really didn’t know how to respond to him. He was convinced that immigrants and refugees steal jobs from U.S. citizens, take away opportunities otherwise entitled to hard-working “Americans,” and breed violence. He also suggested, as Trump does routinely, that the mainstream media are dishonest. A part of me wanted a debate, but then I concluded that wouldn’t be a skillful response — I don’t consider myself adept at debating anyway. So I just listened, tried to relax my visceral reaction and resistance to his views, and a few things happened. First, I stopped focusing only on the man’s judgments and started paying attention instead to his suffering. 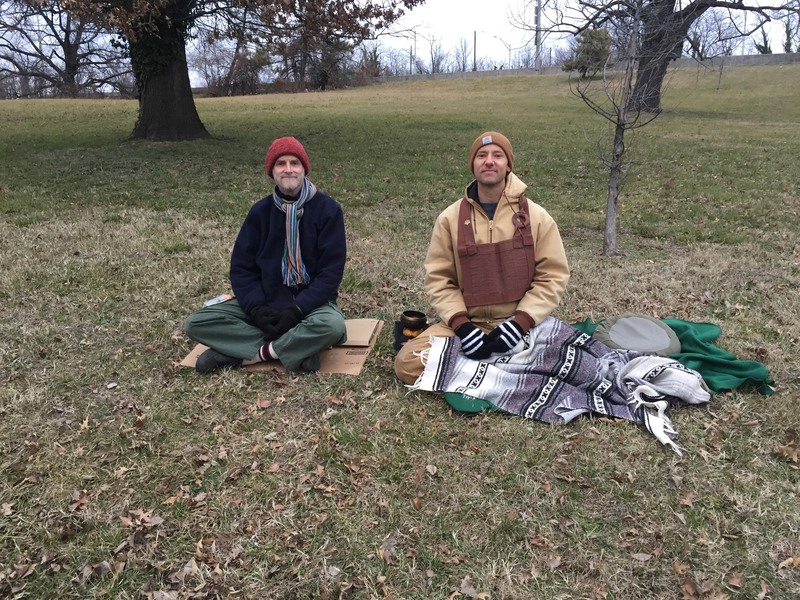 By connecting with his emotional experience, I was able to see the desperation beneath his views — as well as how thoroughly Trump and his team have reframed the causes of national wealth and resource disparity (i.e., five years ago we might have joined each other in the occupy movement). Finding an “other” to blame is of course Trump’s strategy to form group cohesion in the service of his fascistic ends. While I could have argued this point, by recognizing the man’s pain (i.e., communicating that I’d heard the fear and anger underlying his political positions) there was a momentary shift in the conversation. He stopped blaming immigrants and started talking instead about the culture of greed and materialism that necessitates global poverty, structural deprivation, and war. Of course this line of inquiry is threatening, because to put our economic, political and social systems into question implies a re-evaluation of the values, motivations and myths underlying them. It’s easier to blame others, and the man eventually came back to this strategy and ultimately called upon “National Security” — in this administration, a euphemism for White Nationalism — as a reason to justify the travel ban. The conversation taught me that, while I might want to argue with the people who support Trump, it’s vitally important for a new kind of intentional engagement with his promoters: hearing and re-framing the fear and anger that often motivates their allegiance so that, at the very least, they’re invited to consider an alternate view of what’s driving their dis-ease. While the “America First” platform is delusional — and violent, racist, bigoted, etc. — I don’t think it helps to simply argue the points and dismiss the strong emotions fueling them. I wholeheartedly believe and participate in the movement to resist Trumpism AND I think it’s also necessary to make every effort to dialogue with even his fiercest supporters. The way forward, in my view, is through encounter, not just opposition. There are too many echo chambers, on both sides, and to realize a world without sides we need, I think, to practice dialogue as much as dissent. I’m also realizing the importance of renewal in these turbulent times: returning to images, stories, symbols and words that inspire the fortitude to persist, to resist. Amid all the Islamophobia, xenophobia and hate espoused by the Trump administration, and tolerated if not promoted by so many republican politicians, I find it inspiring to read and re-read and reflect on Emma Lazarus’ poem, The New Colossus. Mother of Exiles. What a vision! And what an indictment of the current administration! And a servant to all in need.